Lupus, discoid - view of lesions on the chest: This close-up picture of the neck clearly shows the typical rounded appearance of discoid lupus. The whitish appearance is caused by scaling. The two dark spots are biopsy sites and are not part of the disease. The round or disk shaped (discoid) rash of lupus produces red, raised patches with scales. The pores (hair follicles) may be plugged. Scarring often occurs in older lesions. 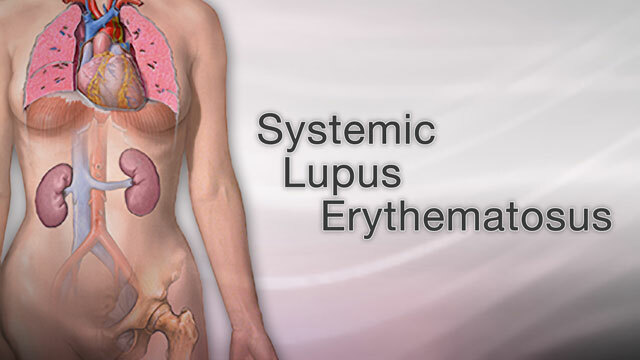 The majority (approximately 90%) of individuals with discoid lupus have only skin involvement as compared to more generalized involvement in systemic lupus erythematosis (SLE). This is a photo of a systemic lupus erythematosis rash on the face. 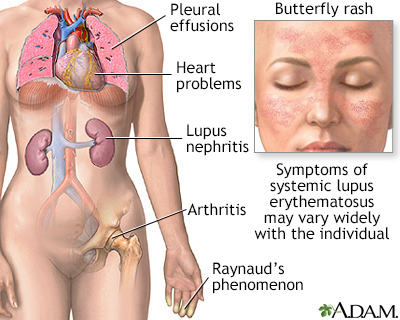 Lupus erythematosis often produces a butterfly rash or malar rash. Typically, the rash also appears on the nose.